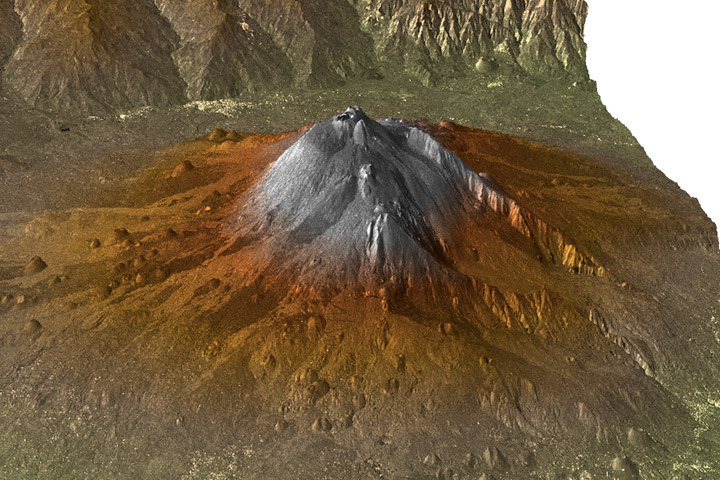 The 3D view is scaled so the volcano appears much higher than it does in real life—perhaps four or five times higher—but it’s impossible to tell since the caption doesn’t say. 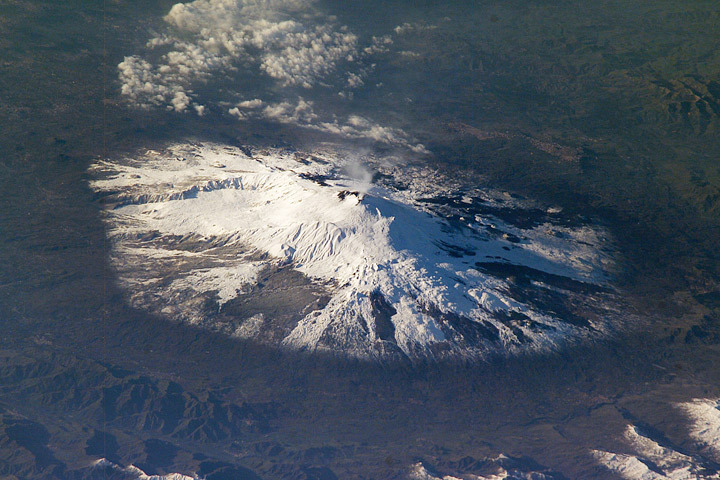 My big problem with this is that Etna looks like a classic, steep-sided stratovolcano (like Mount Fuji), rather than a complex mountain formed from a combination of viscous lavas (typical of stratovolcanoes), fluid lavas typical of shield volcanoes (like the Hawaiian Islands), and collapses (like Mount St. Helens). Why does it matter? Because topography gives clues to the underlying geology and processes that form a landscape. For example, the angle of the walls of the Grand Canyon is determined by the rock type: hard rocks form cliffs, soft rocks form slopes. The vertical granite walls of Yosemite are composed of hard granite that resisted the erosion of ice age glaciers. The reason for the shape of mountains on Venus is perhaps even more interesting. It’s so hot on the surface (465°C) that most of the rocks creep: over time solid materials deform under their own weight. 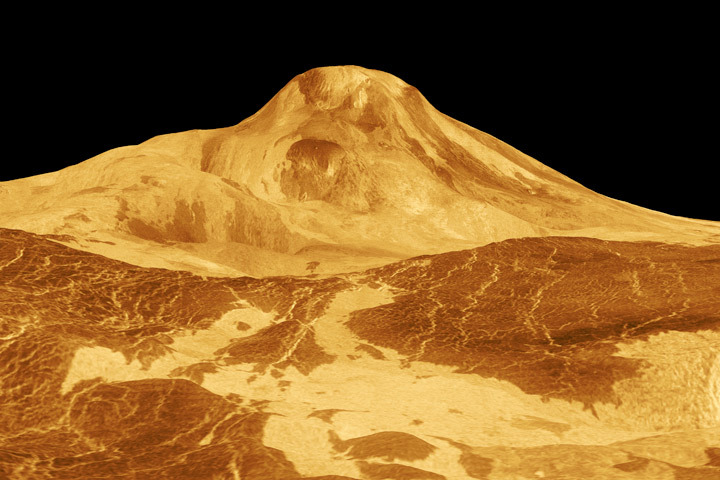 This limits the height of mountains on Venus, and ensures that steep slopes—if they exist at all—are extremely rare (and likely indicative of active tectonics). The vertical exaggeration used in images of Venus’ surface obscures some of the fundamental processes that shaped the planet. One final note: If you absolutely have to use vertical exaggeration, at least indicate that fact in the caption, or even better, include a scale on the image itself. The USGS explains: “lava can instantly transform seawater to steam, causing explosions that blasts hot rocks, water, and molten lava fragments into the air.” No kidding. 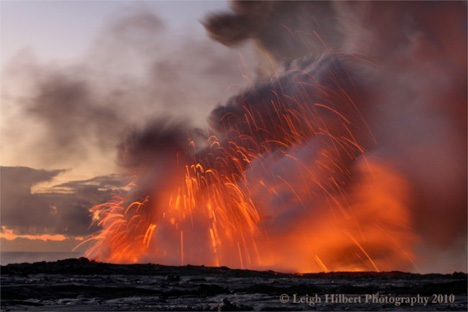 Leigh’s site, Hawaiian Lava Daily, has some of the best photos of Hawaii’s active lava flows I’ve ever seen. He also pointed me to this description and photo essay of the last moments of Gary Sleik’s house in Kapana Gardens—destroyed by lava in July—as well as a recent “wake” for the house. An intimate look at events that can appear quite impersonal from space.